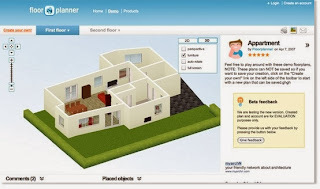 We are going to create our very own floor plan today with our free accounts from www.FloorPlanner.com. Follow your 5th Grade Floor Plan Checklist to create your "Ground Floor" today. What is a floor plan? See below. Having trouble designing your own plan? You can view real floor plans from. Select a floor plan to view at www.floorplans.com and see if you can create a similar plan with FloorPlanner.com.